Earlier this year at the ISA Sign Expo, I got a chance to meet Jude Cook, owner of Cook & Company Sign Makers, a sign shop located in Tucson, Arizona. While getting to know him, he couldn’t help but talk about his passion for neon and the sign business, including his latest venture – opening a sign museum in October of 2018. Jude Cook stands outside the Ignite Sign Art Museum in Tucson, Arizona. A Ventex transformer powers the “Ignite” portion, as well as many of the signs inside the museum. Cook initially started his shop in 1976, focusing on hand-painted and carved wood signs. In 1996, he expanded his company’s services to include neon work. Eddie Durazo is Cook’s in-house neon bender, who’s been bending for 26 years. Cook initially told Durazo that they’d maybe keep him busy half time, but he’s worked full time since the day he started, surprising even Cook by the amount of glass the shop works on. Wholesale work, some new projects and restoration projects keep Durazo busy. “We have restored 24 signs in the area over the past 8 years,” Cook said. Of all the pieces Cook has had a hand in restoring, the “Diving Girl,” is one of his favorites. It’s a night-and-day difference Cook’s team was able to accomplish with the sign! 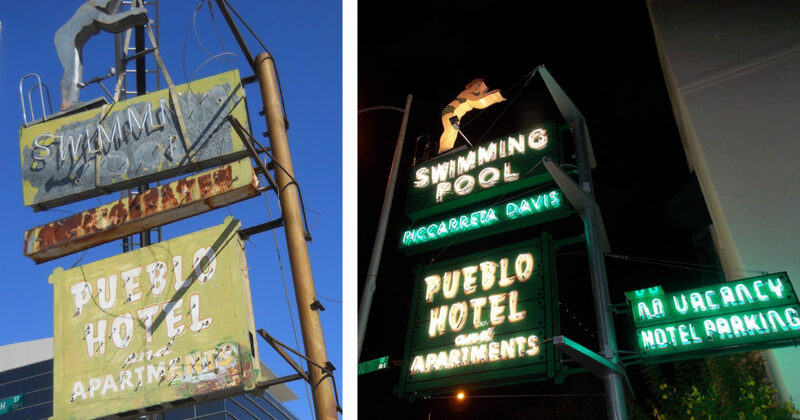 Cook’s shop was able to restore this “Diving Girl” neon sign to its original glory. Ignite Sign Art Museum was a project that Cook’s wife, Monica Hay Cook, and him started looking into about three years ago. He’d been casually collecting signs for over 40 years, so his collection was reaching critical mass. He either needed to do something or stop collecting and start selling stuff – and he wasn’t ready to do that! Their vision was to be a little different than already-existing sign museums, like the American Sign Museum, Museum of Neon Art, The Las Vegas Neon Museum and the exhibit in Baltimore’s Museum of Industry. 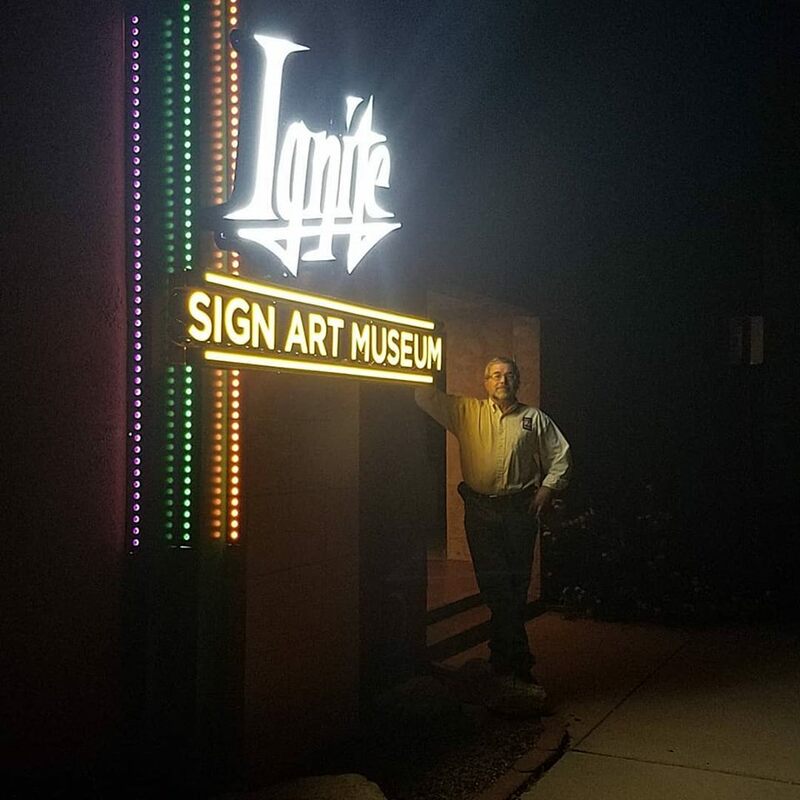 As the pieces started coming together for the Ignite Sign Art Museum, the sign collection primarily featured Tucson signs that are from just after World War II. With an emphasis on the artistic elements of these hand-crafted signs, the couple’s goal with the museum is to preserve signs, educate people about the value of signs and entertain them at the same time. 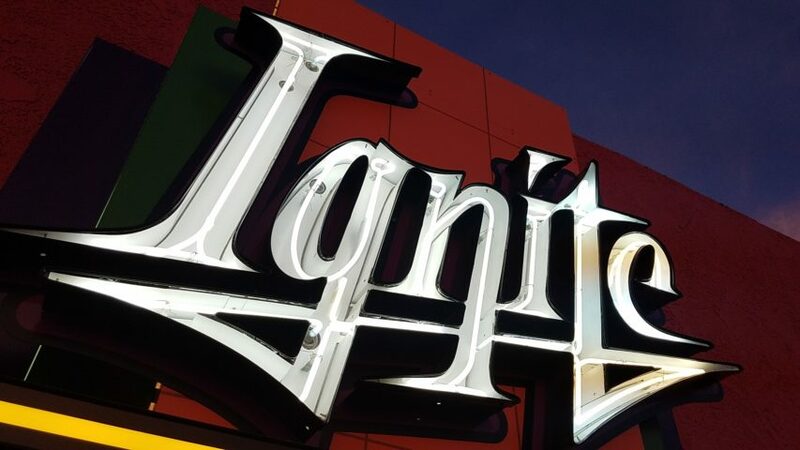 The grand opening for the Ignite Sign Art Museum was held Wednesday, October 10, 6–9:30 p.m.
Rich Matas, Ventex’s Pacific Southwest Sales Representative, and I were both at Ignite’s opening, as well as several of the Arizona Sign Association’s board members. Be sure to check out our post-event blog to get an inside peek of the museum. All fields are required. Your email address will not appear publicly.